I was lucky enough to score an e-ARC of Rhonda Parrish’s latest alphabet anthology, C is for Chimera. Releasing April 12, this book is a good showcase for Parrish’s literary curatorship. I’m a huge fan of Parrish’s anthologies, from Fae to Corvidae and its companion Scarecrow, so I jumped at a chance to review her latest. And while this definitely has a different feel than her Magical Menagerie series, her skilled editorial touch is still obvious. First, I should explain that each of the alphabet anthologies has 26 stories, one for each letter of the alphabet. The title of each story is listed at the end of the story, rather than the beginning, so I’ll just be referring to each story by its assigned letter. I don’t want to spoil you! 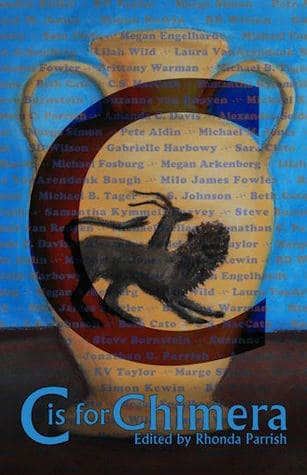 Alexandra Seidel’s gruesome “A” follows Etia and her twin sister, the narrator, into the world of alchemy and chimaerae. The story is an eloquent descent into madness, and the world-building is subtle and deft. “A” plunges the reader into the anthology full speed ahead. “B” by KV Taylor is set in the United States of the 19th century. Jackson, a police officer, is asked to investigate the disappearance of the town doctor–a man with unusual habits. What Jackson finds is related in a wonderful voice that is folksy and friendly and ultimately renders the end of the story even more chilling. “C” by Marge Simon is a short and vivid nightmare, as Robert dreams and dreams and dreams again–always of a beautiful woman asking him questions he can’t answer. It leaves the reader feeling breathless and trapped within its tight writing. Pete Aldin’s “D” is the perfect follow-up to “C”. Alec wakes to find a very odd intruder in his bedroom. Or is he still dreaming? The conversation that follows is certainly bizarre enough for a dream, but the depth of emotion and layers of nuance in it are impressive. “E” by Michael M. Jones is the story of a nameless girl spirit who flits through school hallways, torn between observing the world of the living and wondering about her mysterious past. But a group of bullies gets the spirit’s attention, and she is forced to decide whether to become more than she is. “F” by Simon Kewin begins with a haunting sentence: “Eventually he grew weary of the long winter he’d escaped to.” So opens a cold, dark, windswept story of loneliness and yearning, of a being too long removed from the human race. B.D. Wilson’s story “G” is a chimera itself, cobbled together from the past and the present, just as main character Bairn is cobbled together from a theatrical world of ring-fighting and the life-or-death stakes of the Dogfights. “H” by Gabrielle Harbowy is a short and chilling piece set in a laboratory. Harbowy makes every word count. “I” by Sara Cleto is a delightful and beautifully written retelling of Cinderella…but this is not the Cinderella you’re used to reading. We’re given a strong, introspective main character, and a villain you wouldn’t expect. This is honestly my favorite piece of the chimera anthology. Megan Englehardt’s “J” is a fun, funny origin story, told in the tradition of Native American legends. With a strong narrative voice, it carries the reader along easily. “K” by Michael Fosburg takes us on a nightmare journey through a blight-stricken world of steampunk and demons. The grief-stricken (and guilt-stricken) main character is complex and compelling, and the setting is vivid. “L” by Megan Arkenberg is atmospheric, the remote setting almost as important a character as the unnamed protagonist and those she interacts with. Arkenburg juxtaposes beauty and horror to create a gorgeous little story of hope. “M” by Lilah Wild asks the reader to examine your own self-image as the main character undergoes a metamorphosis inside a frenetic department store. It’s a compelling piece. “N” by Laura VanArendonk Baugh takes us back to the powerful kingdom of Atlantis, where a prophecy is badly received by the proud king. His son goes on a quest for truth alongside a temple bull dancer and is forced to make some very difficult decisions. A neatly-executed coming-of-age story in a richly imagined setting. “O” by Milo James Fowler is a tragic story written almost like a Biblical parable and set in what feels like the Old West. Gruesome and sad, it’s a gorgeous story about love and fear. I LOVE the format of “P” by Brittany Warman. Written up like a police case file, it details a macabre series of incidents that are somehow connected to a strange art exhibit in Manhattan. Warman forces the reader to ask herself about human nature and how others perceive us. “Q” by Michael B. Tager takes the reader on an introspective journey as a student and master leave their monastary on a pilgrimage. Student and master discuss their beliefs as the student comes to understand the true source of their power. L.S. Johnson’s story for “R” probably ought to come with a trigger warning. It’s a visceral deconstruction of a woman’s life after one horrific incident–and it’s a story of a transformation, of creating someone rare and wonderful out of violence. Gracefully told, the story is one that sticks with you. “S” by Beth Cato takes us to a post-apocalyptic world where a tenacious doctor is working against the sickness that has ravaged her world. Her chimera companion, Tiger Boy, shows us the world through the eyes of one of the survivors. Cato skillfully combines sorrow and hope in her short piece. “T” by C.S. MacCath is a symphony of words, a glorious creation story that draws on physics and light and life. “U” by Samantha Kymmell-Harvey is another marvelously crafted post-apocalyptic story, focusing on genetic experimentation and the unintended side effects. Beautifully written, this futuristic story resounds with the echoes of a time when women could be locked in institutions for being ‘hysterical’, and yet the story also carries the reader forward into a new world. “V” by Steve Bornstein takes the classic fantasy beast-slaying trope and turns it on its head, as young Melick tracks people who raided his village and has an encounter with a chimera that changes his outlook. It’s a fun fantasy adventure that makes a nice, light-hearted addition to this collection. Suzanne van Rooyen’s “W” is full of gorgeous sentences like this opening: “All the words I cannot say stain my skin in inky ribbons.” As the story progresses, we experience the power of words, not only through the writing, but through the characters. “X” by Michael Kellar is a strange and engaging tale of a woman who has an accident, and her not-quite-usual recovery afterwards, told in an almost dreamlike prose. “Y” by Jonathan C. Parrish is a character piece about a man who has an unusual way of viewing the world, a fixation with light and color and sensation. “Z” by Amanda C. Davis is a surreal science fiction story that touches on the human and the animal in all of us in a very unique way. It’s a lovely and quiet way to end the anthology. I enjoyed C is for Chimera and highly recommend this to anyone who loves speculative fiction and short stories of the weird and wonderful. Add it to your Goodreads list or pre-order on Amazon.